1. Take 1/2 cup of milk from the recipe, warm it in the microwave for about 30 seconds and steep the ginger in it for 10 minutes and then strain the ginger out. 2. Warm another 1/2 cup of milk from recipe amount and dissolve the yeast in it. Allow the mixture to sit for 5 minutes. 3. Combine the yeast-milk with the ginger-milk along with the remaining 1 1/2 cups of milk and set aside. 4. In the bowl of an electric mixer combine the sugar, flours, oats, cinnamon, and baking powder. Mix to combine and then add the milk mixture and blend. 5. Pour batter into one large or two smaller containers leaving plenty of room for the batter to rise. Cover and store overnight in the refrigerator. 1. Preheat the waffle iron. 2. Melt butter and whip egg whites to soft peaks. 3. Put the batter made the night before into the bowl of the electric mixer, add 3/4 of the butter and mix until fully incorporated. 4. 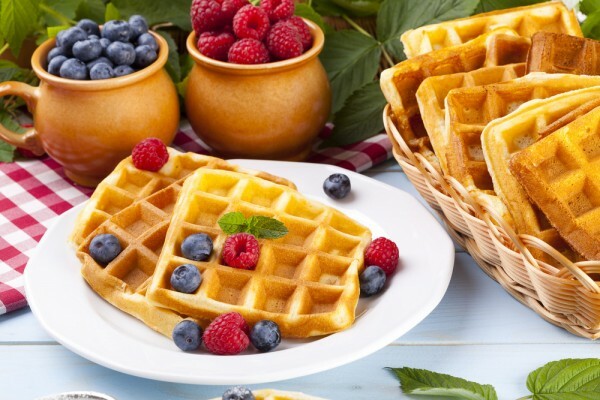 Add the egg whites, blend, and make a test waffle to make sure that the waffle iron is set at the right temperature and the batter is the right consistency. You may need to add more butter and/or egg whites – if the waffle is too heavy add a bit more of the egg whites and if it sticks try a bit more butter.